A goat in the garden: Peaches, glorious peaches! 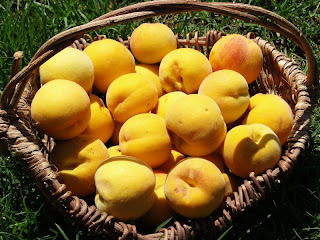 Well, its that time of year when my beautiful peach tree rewards me for the forsight to plant it 5-6 years ago. Money well spent I reckon! This tree is a yellow fleshed clingstone, called Golden Queen. Fantastic variety, although I am biased. I have never bought a peach from the shop since I tasted my first one off the tree (shop bought peaches are NOT what peaches taste like). The last few years we have had really good crops, and even though the birds have gotten to much of the fruit (plus peaches seem to just want to fall off the tree green...), we have still picked well over 10kg. I've bottled 11 bottles so far, plus eaten many, and given some away, plus the chickens have had some etc etc. I really enjoy the bottling of the fruit, not sure why more people don't do it. Sure it takes some time, but so does working to pay for the food we buy, and I know what I'd rather do! And the end product is so much better than anything you buy in the shop. 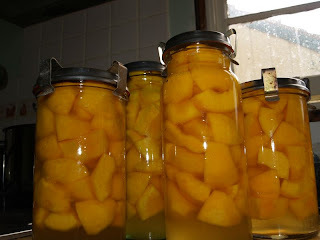 The other advantage is that I can reuse and reuse the jars (most of them are already second hand) so I know that I am doing something good for our planet too. Funny thing, I had just run out of jars and a friend of ours came round to help with some work at the farm, and brought me 2 big boxes full (all with stainless steel lids too!). 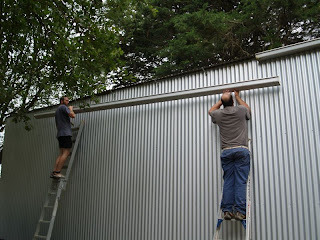 Speaking of the farm, here is said friend and Brad putting up the guttering on the shed! We still have a few bits and pieces to finish off the outside of the shed, some flashing, and the other side guttering. Its so nice to see the shed with walls now, a great feeling of accomplishment. Anyway, soon we can start on some new project! Those peaches look so good! Beautiful photographs of the peachy goodness!! Thanks for listing the name of the variety. The shed looks great! Progress! MMM. Growing up the the South (US), we grew peaches by the barrel. 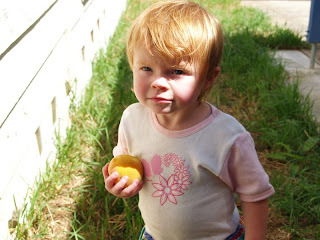 I have such fond memories of peaches. Peach wine, syrups, pies, cobbler, yum! How much does one have to do?